The Bronson Cycle Has Arrived: Mrs. Marguerite Rumgay , proudly stands beside her cycle owned and used by Michael Parks of the TV series “Here Comes Bronson” (funny!). 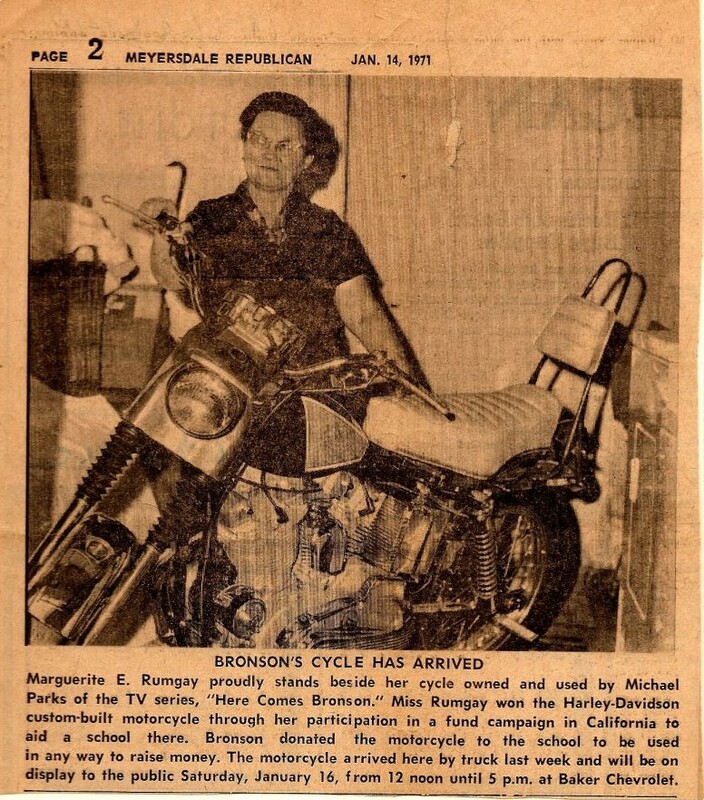 Mrs. Rumgay won the Harley-Davidson custom built motorcycle through her participation in a fund campaign in California to aid a school there. Bronson donated the motorcycle to the school to be used in any way to raise money. The motorcycle arrived here by truck last week and will be on display to the public Saturday, January 16, from 12 noon until 5 p.m. at Baker Chevrolet. Webmaster note: The Meyersdale Republican is in Pennsylvania, Somerset County, but the only Baker Chevrolet I could find was in North Carolina. Well I told you guys I was on a quest while on my way back from Anamosa..... (June 6th) I stopped into Meyersdale Pa. and started asking questions. I was directed to Cynthia who is the local genealogy expert. Through her, I tracked down the guy that owns the bike that Margaritte Rumgay won in the raffle . Well tonight I did some more follow up and have some very interesting news to share!!!! This evening I talked to the guy that now owns the bike!!! This is the Bike that Michael Parks donated to his daughter's school, and was raffled off. Margaritte (Peg) Rumgay won the bike. According to the present owner (Roy of Berlin Pa.) she owned the bike for two years and sold it to a man named Gordon. As a side note, the first year that I had my bike on display at Mountainfest 2009, a young man and his girlfriend walked by my bike and said, I know the guy that owns a bike that Michael Parks owned. My ears perked up and I stopped him and asked who that person was. He told me that it was Gordon of Meyersdale Pa. The young man said that she had sold the bike to Gordon two weeks after she won it. (this is different than what Roy says) Since then I have tried to find Gordon with no luck, then as luck would have it, when I had my bike on display at Timonium 2010, a man named Gary and his wife stopped by my booth and said that they had a newspaper clipping about Mrs. Margaritte Rumgay winning the bike. I gave them my info and they scanned the article and emailed it to me. That is the article/photo you see here. So back to present day and tonight's conversation... Roy was great to talk to!! He has a photo copy of the title that was given to Mrs. Rumgay hanging on his wall in his living room!!!! It shows Michael Parks as the original owner. The bike's value was $1,765.00, It shows that it is a 1969 Harley XLH and the title was issued on January 5, 1970. He said that his father worked with Gordon at the phone company and his father tried to buy the bike for many years. In August of 1994 Gordon needed money, so he sold the bike to Roy's father. Roy's father died in 2005 and Roy now owns the bike. Today the bike looks different, but all of the parts are there to put it back to the way it was when it was won by Mrs. Rumgay. Here is an interesting tidbit that I did not know about the bike. From the pictures I could see that the bike had a custom lace paint job. If you remember back in the day it was popular to get a lace table cloth and lay it on a car or bike and paint using the lace for a stencil. The lace used for this paint job was Michael's wife's bridal veil!!! The paint was fading and cracking and so Gordon removed the tank and bought a new tank to replace it. A local painter named Charlie painted the new tank to match the rest of the bike, at the same time Gordy removed the stock exhaust and put on the pipes that are on the bike now. The original tank and the pipes are in storage with the bike. Roy says the bike has about 7,000 miles on it and that he rides it about twice a year. He said that at some point in the future he will allow me to come and see the bike, but he was not sure when it would be. Billy G.